A Chofu heater is a wood fired water heater that works without pumps, electricity, or chemicals to keep your hot tub perfectly warm and comfortable. It works on the thermosiphon mechanism, or the principle that warm water rises, in order to pump warm water into your hot tub. The Chofu uses a simple but elegant mechanism where the cold water comes in from the bottom of the tub, is warmed by the wood fired heater, and exits into the top of the tub. The Chofu heater can easily be retrofitted onto an existing tub or tank for efficient, easy heating without chemicals or pumps. Wood fired heating for your stock tank hot tub does not need to be expensive or complicated; the Chofu heater is affordable and easy to install. The stove body is made of grade 316 stainless steel, which means that it stands up to being used outdoors. The stainless steel firebox inside also means that you can use it without worrying that it will be burned out. For maximum efficiency and minimum emissions, the smoke outlet is designed to facilitate secondary combustion of the smoke. This minimizes the danger of sparks as well as the negative environmental effects of wood smoke emissions. With a stock tank hot tub with wood fired heating, you get incredibly efficient heating with excellent heat transfer. The whole outside of the stove is a heating surface, and the heat transfer to the water is doubly effective, with both the wood burning area and the chimney area providing heat to the water. 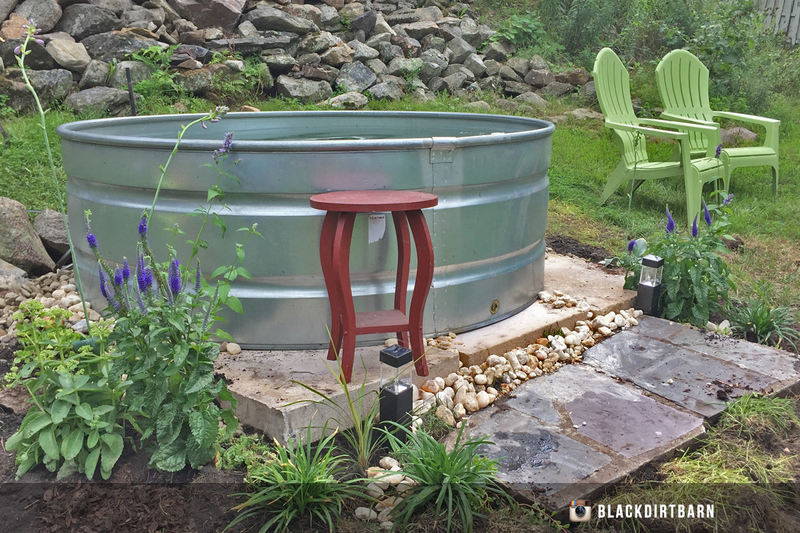 With its sturdy construction and expert engineering, you can count on your wood fired heating for your stock tank hot tub to get your stock tank soaking tub perfectly toasty and warm for your relaxing pleasure. The Chofu heater works like any other wood burning stove. It works best with hard, dry woods. The interior dimensions of the wood box are 18 in x 14 in x 14 in, so the longest piece of wood you can burn is 17 inches. For best results, use sticks that are at least 1 ½ – 2 inches in diameter. With this size of wood, you should be able to load new sticks at 45 minute intervals to maintain a constant, steady heating temperature. As with other wood burning stoves, the Chofu heater has an air intake system that allows you to control exactly how hot the fire burns, and therefore how hot the water gets. When the air intake is wide open, there is a lot of oxygen for the fire and therefore the fire burns very hot. When the air intake is closed, there is of course less oxygen to facilitate the combustion process. As a result, the fire burns cooler and the wood lasts longer. This means that you can open up the vent to get the water heated quickly, and then close it when the water is at the desired temperature to maintain a comfortable level of warmth. The Chofu is extraordinarily tough, and it can be out in the weather without damage. However, there are still some things you need to do to protect it from damage, especially when it freezes. When the temperature is going to dip slightly below freezing overnight, cover the Chofu with an insulating cover when you are not using it to make sure that the water inside the pipes does not freeze. When the temperature is going to be well below freezing or is going to freeze for longer than overnight, drain the water from the Chofu to ensure that the interior pipes do not burst. You can drain the water from the Chofu without draining the water from the tub by closing the inlet valves from the tub. You can also drain the tub first, which will remove about ¾ of the water from the Chofu, and then drain the remaining water from the Chofu directly. Before starting another fire in the Chofu, make sure the tub is filled and the water inlet valves are open. The Chofu uses water circulation to move heat from the interior and exterior surfaces of the stove. If water does not circulate through the stove, the metal will quickly become damaged from the heat of the fire. The secondary combustion of the Chofu eliminates most sparks, which helps to reduce or eliminate fire danger. However, to be absolutely safe, you may want to add a chimney cap at the end of the stove pipe if the stove pipe is venting in a fire danger area or near trees. Note that the chimney cap will reduce the ventilation pull through the stove, which will slow combustion and make the stove burn somewhat cooler.